Online marketplace Etsy has been on a mission of openness lately — last week, it gave an in-depth explanation of a few recent outages — and on Friday it shared the details of the hardware architecture that powers its popular business. Etsy isn’t Facebook (s fb) in terms of scale or specialization, but it’s always interesting to see what’s under the covers of growing web companies. And under the covers at Etsy is a lot of Supermicro gear. According to blog post author Laurie Denness, a single class of Supermicro 2U, 4-node chassis powers powers a high number of workloads including memcached and web serving. Like many large web companies, including eBay (s ebay), Etsy tries to stick with a limited hardware stack that’s versatile enough to handle multiple workloads. [This setup] gives us machines that can handle over 4 times the workload of the generic nodes above, whilst using the same density configuration and not that much more power. 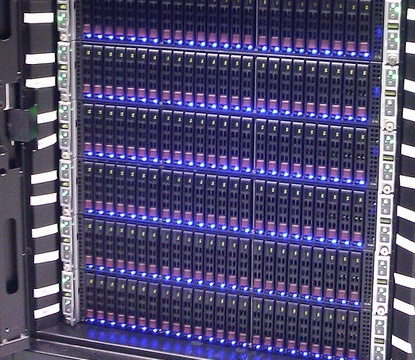 … The nodes have 96GB of RAM and a single 800GB SSD for the indexes. This follows the same pattern of not bothering with RAID; The SSD is perfectly fast enough on it’s own, and we have BitTorrent index distribution which means getting the indexes to the machine is super fast. HP (s hpq) also gets a little love at Etsy, powering both its MySQL database and a handful of special jobs, such as its Hadoop NameNodes “that don’t need much horsepower, but we deem important enough to have RAID,” Denness wrote. Etsy’s hardware choices aren’t earth-shattering news by any means, but this type of openness is critical as a great number of businesses make their home on the web. Speaking openly about this stuff (hint, hint, Twitter) helps give other companies ideas about how to improve their systems, while also providing the opportunity to learn from suggestions from others (a la profiting from code contribution in open source software). It also helps advance the idea of a crowdsourced model for performance benchmarking, where everyone can see setups and performance data from in-the-wild systems that haven’t been tuned to the nth degree by vendors. In a webscale world where software reins supreme, a floating hardware tide floats all boats. Feature image courtesy of Shutterstock user MilousSK. Now that’s what I’m talking about!! This article is a dream come true in nerd world.